For most people, the start of summer usually also signals the start of lots of traveling. Preston and I kicked off the start of the summer season with a four day trip to Rehoboth Beach, Delaware with two close family friends. Although Preston and I had planned to run on the boardwalk at least one day while on vacation, that plan was quickly changed once we arrived and realized that the temperatures were anticipated to be colder than average for this time of year. Our first day was also spent avoiding being outside due to the rain. Our trip made me realize just how hard it is to maintain a regular workout schedule while on vacation. This past weekend’s trip wasn’t the first time that I’ve tried to workout while on vacation, but was certainly the first time that I’ve been training and working towards a specific fitness goal at the same time as being on vacation. Prior to our wedding almost two years ago, Preston and I were going to the gym several times a week. Although we had planned to continue working out during our two week honeymoon in Hawaii, the reality is that we only made it to the hotel gym once, at the beginning of our trip. 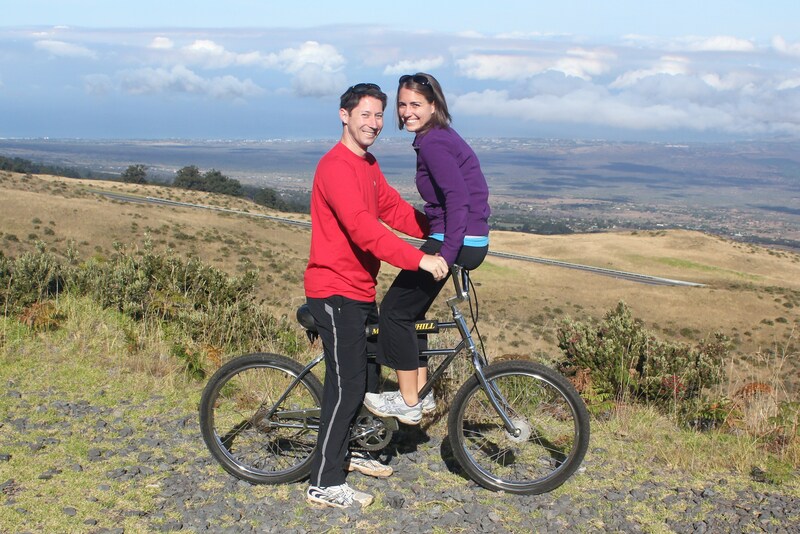 We are both active people and took part in several physical activities while in Hawaii, including snorkeling, hiking, and bike riding, but our fitness activities were outside the norm, and by my current training plan and fitness standards, weren’t a part of our “normal” fitness regime. Of course, our honeymoon hasn’t been our only trip that we intended to go to the gym during. We’ve taken several trips since then, and the only places where we’ve truly maintained any resemblance of a normal fitness routine has been when we travel to Illinois to visit my family. Part of that might be the result of using our Gold’s Gym travel passes there, but the Gold’s there is still slightly different from our Gold’s here at home. Gym travel passes or not, the reality is that its nearly impossible to maintain a “normal” workout routine while away from home and out of your normal daily routine. This has gotten me thinking about how to adjust and plan my training during our upcoming summer travels. We currently plan to be out of town at least once a month this summer, with our longest trip lasting almost two weeks when we’ll be in southern California. It will take some planning in order to ensure that we are still active while on vacation, but the reality is that we won’t be at home, we won’t be in a normal routine, and we’ll be trying to work out under different conditions. The climate there isn’t the same as here, therefore, working out won’t be the same. The equipment in hotel fitness centers also varies greatly (there was only a single treadmill, bike, and elliptical at the hotel we stayed at this past weekend). We will also likely be doing a couple of physical activities that are outside of our normal routine while in California, including possibly ziplining while on Catalina Island. Since we’re planning to spend a couple of days at Disneyland, there will also be a lot of walking during our trip. But ziplining, walking, and running aren’t the same thing. While away, it’ll be important to find a balance between relaxing and having fun with still maintaining our training. Will we be running as much as we do when we’re home? Probably not. But will it still be important to get some running in among other physical activities while we’re away? Absolutely. This entry was posted in Training and tagged Gold's Gym, training, vacation. Bookmark the permalink.